Born and raised in Southern California. I have 4 brothers on 1 sister. Served in the United States Air Force as a Firefighter from 1977 to 1981. Was station in Minot ND, Galena, AK, and Edwards AFB, CA. Received BA degree in Geography from California State University, Los Angeles, 1986. Lived in Las Vegas, Nevada from 1989-1991. Worked as a Cartographer and Aerial Photographer. Moved to east Tennessee in 1992. Member of the Tennessee Air National Guard from 1994 to 1999. Worked for the Public Building Authority as a Safety Officer and Communications Officer since 1996. Received MS degree in Safety Management from the University of Tennessee, 2005. Currently live in Fountain City with my wife Sue. I have one son, Dillon who lives in Farragut, Tennessee. Attended Karate College from 2009 to 2011. Red Cross CPR/AED Instructor for my organization. Instructor Trainee at Broadway Family Karate 2009 to 2010. 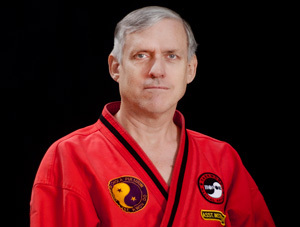 Certified Instructor at Broadway Family Karate since October 2010. To be a positive influence on the lives of my students. To improve my interpersonal skills. To improve my Taekwondo skills. How do you use your martial arts training in your own life? As a way to maintain discipline. To improve my mental focus. What got you started studying the martial arts? I joined Broadway Family Karate soon after my son joined. I saw martial arts as a way to improve my physical and mental health.